Why is the Remington S7310 Hair Straightener so Effective at Straightening Fine Hair? Has trying to straighten your fine hair got you down because you tend to damage it when doing so? Maybe you need a little boost from the flat iron that you use. Many stylists will tell you their clients tend to damage their hair because they use flat irons that don’t match up well with their hair type. Well, we have been hearing about this innovative flat iron that actually will allow you to straighten your hair when it’s wet to help protect it. 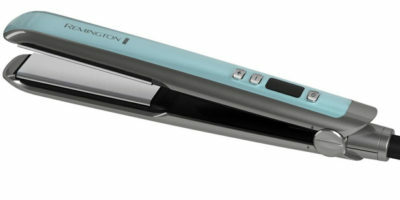 It’s called the Remington S7310 Wet 2 Straight Hair Straightener and in this article, we will take a closer look at it. This unique hair straightener that works even when wet features smaller size 1” heat plates that give you some nice hair straightening and curling options when using it. It also has 30 heat setting choices that range between 300ºF-400ºF. The Remington S7310 Hair Straightener has the rare ability to straighten your hair when its wet thanks to its many built-in steam vents. Since the super-heated steam can escape it does not damage your hair is you straighten it. Its 1-inch heating plates are nicely ceramic titanium coated too. 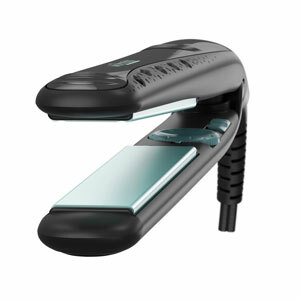 The Remington S7310 Hair Straightener is very lightweight and easy to use too. It only weighs a little over 14 ounces. It has rounded edges to make it easier to use and a 60-minute automatic shutoff switch. It can be ready to use in 30 seconds or less too. The power cord with attached swivel end is just 6-feet long. That’s about 2-3 feet shorter than what a normal salon style flat iron power cord would be. Whenever you hear a professional stylist talking about protecting fine hair the word moisture retention is always used. It is one of the hardest things to achieve when using a super-heated flat iron on your fine hair. Remington has found a way around that with this model flat iron that works even when your hair is wet. You don’t have to worry about ‘moisture retention in that hair straightening scenario. It is estimated that straightening wet hair retains up to 60% more moisture than when you straighten your hair dry. The 1″ ceramic titanium plates on the Remington S7310 Hair Straightener really help prevent fine hair from being damaged too. These plates heat very evenly which helps eliminate damaging hotspots. This, in turn, helps keep your fine hair from overdrying and getting frizzy. The warranty on the Remington S7310 Hair Straightener is very average for the industry. It comes with 2-years of warranty protection. One concern we have with this flat iron is that you really don’t know the exact temperature you are straightening your hair at. That’s because there is no digital readout and there are no markings on the heat selection dial. 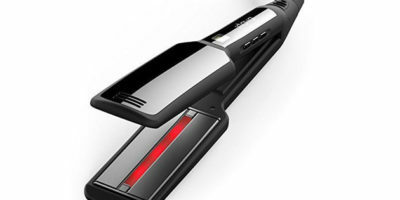 We also think the power cord is very short compared to other model flat irons. It’s just over 6-feet long which we think would be better if it was a couple feet longer. We all thought this was a very interesting concept in flat irons. It most definitely is a flat iron that we think has some advantages over others because you can use it wet. We also like the versatility and hair damage protection its 1″ ceramic titanium plates offer you when straightening your hair. It’s a flat iron that we think is well worth taking a long look at if you are currently shopping for a new straightener for your fine hair.